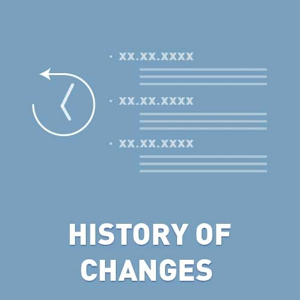 The log of changes of basic store items (products, categories, manufacturers, customers). You can view the history of changes (old and new value). With this plugin, website owner can monitor changes in descriptions and settings of products, categories, manufacturers, customers, localizations. You can see when and what was changed (old and new value). 1. Price of the product was changed. Website owner will see when it was done, what the old price was and what the new price for the product is. 2. If a user changed his shipping address website owner will see when it was done, and what exactly the user has changed. 1. Auditing changes to products, categories, manufacturers, customers. 2. Audit modes. You can set the fields for auditiong in each table. Example. You want to audit only product's name and product's price. 3. Sending a report about the changes by e-mail to website owner site (you can configure the information to receive). 4. Website owner sees what and when was changed, and old and new parameter values. Plugin saves a user who made the changes. 5. Each product, category, manufacturer has new tab History of Changes. Unregistered version is fully operational. It has only one restriction – you can only view the last 20 events. Registration removes this limitation. Compatible with NopCommerce 4.10, 4.00, 3.90, 3.80, 3.70, 3.60, 3.50, 3.40, 3.30. + changed the kernel of plugin (from Nop 3.80). Plugin allows to audit only several properties, you can select them. Changed the look of reports. - fixed buh with SpecialPrice value. + Changed name of plugin. New name is History of Changes. + Added new tab "History of Changes" for each product, category, manufacturer page. Store's owner can easy see all changes.